Direct message us for expert advice. 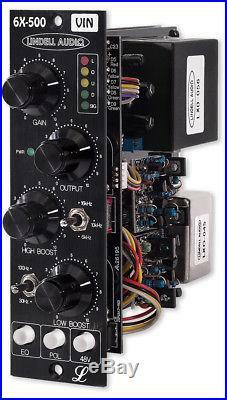 Lindell 6X500VIN 500 Series Preamp. Lindell's'Vintage Edition' 6X-500VIN module features a transformer-coupled mic preamp, passive 2-band equalizer, and 15dB of high boost switchable bandwidth. The all-discrete design combined with gold-plated internal circuitry enables the highest quality of mic amplification, whilst the carefully chosen 1731 OpAmp ensures the best vintage Pultec-style equalisation possible. Passive EQ (inductor and OPA gain make-up). LF Boost: 30 / 60 / 100Hz (approx). HF Boost: 6 / 10 / 16 kHz (approx). Separate high boost bandwith switch. The item "Lindell 6X500VIN 500 Series Preamp" is in sale since Friday, November 17, 2017. This item is in the category "Musical Instruments\Pro Audio Equipment\Preamps". The seller is "audioclear" and is located in Hoddesdon. This item can be shipped worldwide.